I love to teach the flute! I want to help you become the best player you can be and I will do so in a warm, friendly atmosphere. As my student your lessons will be tailored to fit your individual needs and learning style. Whether you have played for many years or just blowing your first notes, you will grow confidence, skill, and have some fun along the way. Jennifer received her Bachelor of Music in performance from the University of North Carolina school or arts in 1991. She also obtained her Master of Music performance from Arizona State in 1993. Jennifer is a member if Central Arizona Flute Ensemble. 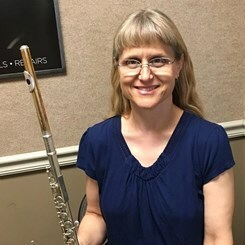 She has been a freelance musician in the Valley since 1993, and has played in many different venues including the recording studio. Jennifer has taught privately since 1989 and is able to teach any method. "I emphasize the importance of scales, arpeggios, and basic theory. I work with beginners through advanced students. Along with traditional techniques i can teach circular breathing." Request Lessons with Jennifer today!